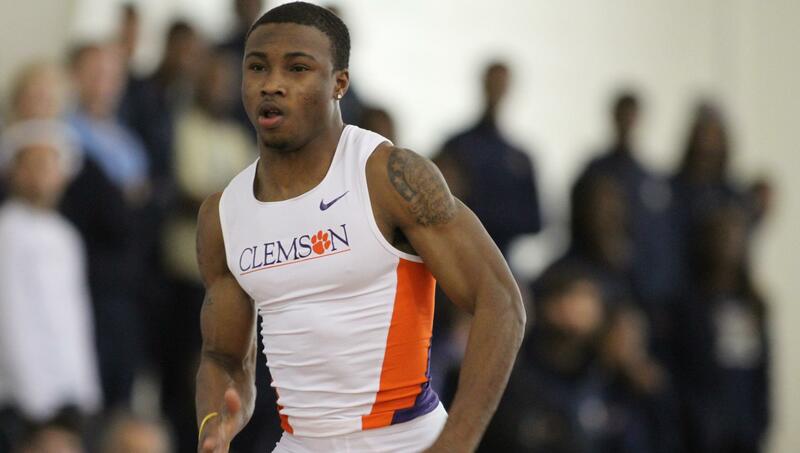 CLEMSON, SC – Tevin Hester matched his personal best by running 6.64 in the men’s 60 dash to highlight an exciting opening day for Clemson track & field at the Orange & Purple Classic. Hester’s performance was one of many wins and personal bests for both the Clemson men and women, who ushered in a new era Saturday. It was the first track & field meet under new Head Coach Mark Elliott. Hester was solid in the prelims with a 6.72, but turned it on for the final. His time of 6.64 matched his previous best from his freshman season, a time he ran at the NCAA Indoor Championships. According to TFRRS.org, Hester’s time is the fastest in the nation early this season. Whitney Fountain was second in the women’s final with a collegiate best 7.54. Justin Johnson turned heads in the final of the men’s 60 hurdles. A former Division II standout, Johnson clocked a time of 7.89 in the final to set a personal best by nearly four tenths of a second. He claimed a victory for the Tigers on Saturday. Anasterasia Terrell (8.64 pre) was the top women’s 60 hurdler in third place. “Justin ran faster than I thought he would, so that shows we still have some quality athletes on our roster in the hurdles,” Elliott said. Natalie Anthony won the women’s 3000 meters. The Randolph, NJ product posted a time of 9:50.31. Clemson also claimed a number of runner-up finishes on the track Saturday. Johnson was second in the men’s 200 (22.44). Nia Fluker claimed silver in the women’s 400, while Brianna Blanton did the same in the 800 and Alexa Womack in the mile. Clemson dominated the action in the field. The Tigers won four events Saturday, including two by Land, the reigning ACC Indoor Freshman of the Year. The sophomore from Albany, GA won the long jump from a short approach, with a mark of 19’11.5″. She then won the high jump a few hours later with a 5’10” clearance. Torian Ware (high jump) and Shai Carpenter (triple jump) were also victorious for the men’s team. The teams return to action next Saturday at the CrossPlex facility in Birmingham, AL at the Auburn Invitational.